To plot the characteristics of thermistor and hence find the temperature coefficient of resistance. A thermistor is a type of resistor whose resistance strongly depends on temperature. The word thermistor is a combination of words “thermal” and “resistor”. A thermistor is a temperature-sensing element composed of sintered semiconductor material and sometimes mixture of metallic oxides such as Mn, Ni, Co, Cu and Fe, which exhibits a large change in resistance proportional to a small change in temperature. Pure metals have positive temperature coefficient of resistance, alloys have nearly equal zero temperature coefficient of resistance and semi conductors have negative temperature coefficient of resistance. Positive temperature coefficient (PTC) thermistor:-resistance increase with increase in temperature. Negative temperature coefficient (NTC) thermistor:-resistance decrease with increase in temperature. 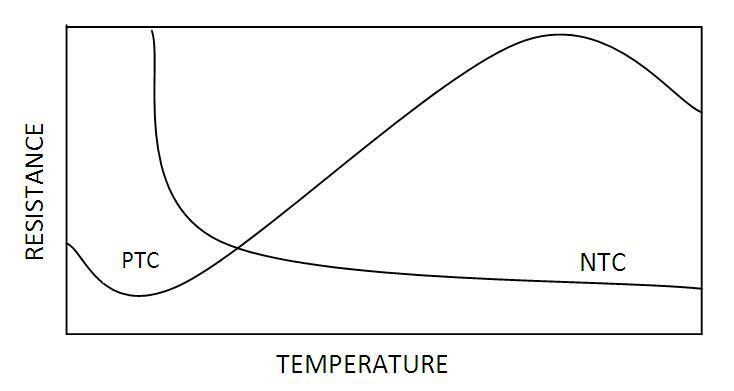 The thermistor exhibits a highly non-linear characteristic of resistance vs. temperature. PTC thermistors can be used as heating elements in small temperature controlled ovens. NTC thermistors can be used as inrush current limiting devices in power supply circuits. Inrush current refers to maximum, instantaneous input current drawn by an electrical device when first turned on. Thermistors are available in variety of sizes and shapes; smallest in size are the beads with a diameter of 0.15mm to 1.25mm. There are two fundamental ways to change the temperature of thermistor internally or externally. The temperature of thermistor can be changed externally by changing the temperature of surrounding media and internally by self-heating resulting from a current flowing through the device. The material specific-constant of a NTC thermistor is a measure of its resistance at one temperature compared to its resistance at a different temperature. Its value may be calculated by the formula shown below and is expressed in degrees Kelvin (°K). and is the temp coefficient of resistance. A graph plotted with in Y axis and in X axis for NTC and PTC is shown below. The slope of graph gives value of β.